Plan your response to an ammonia release before it takes place. Start with locating all firms in your jurisdictional and mutual aid areas that store and distribute anhydrous ammonia fertilizer. This can easily be done by contacting the county or district emergency planning commission or the Minnesota Department of Agriculture. The most important single resource to have on hand is an accurate scale map of the facility with nearby vulnerable resources and populations identified that may be impacted by an incident. Aerial photographs are a very useful tool when constructing a map and are available for any area of Minnesota by visiting “What's in My Neighborhood”. Pay particular attention to where pesticides are stored during your site visits. 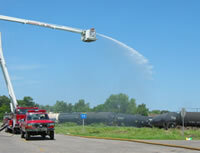 In many cases applying water to extinguish a fire at a building that stores pesticides may make the incident much worse. If the public is protected the best course of action may be to allow the pesticide storage building to burn while protecting adjacent structures. The last step of preplanning is to conduct joint exercises and drills with all interested parties. These are very beneficial and can greatly improve the response coordination. Step 1. What have I got? Step 2. Where is it going? Step 3. How do I control it? Step I - What have I Got? In other words, where is the incident, when did it occur and how did it happen? The answer to each dictates the correct response. WHERE: In a farm field or in town? On a township road or busy highway? Is it near a river, an LPG tank, a pesticide or fertilizer storage building? Upwind of a school, hospital, etc. WHEN: Cold winter day or hot summer night? Morning or afternoon? Quiet Sunday evening or busy Holiday afternoon? HOW: Hose failure, traffic accident, fire impinging upon tank, vandalism, nurse tank rollover, train car derailment, valve failure, severe weather damage, normal release through a relief valve, etc. Refresh your knowledge of ammonia by reviewing the anhydrous ammonia material safety data sheet contained in the facility emergency response plan. Also, review the Emergency Response Guidebook (ERG). This is the guidebook for first responders during the initial phase of a hazardous material incident. Information on health, fire, protective clothing, first aid, and spill/leaks can be obtained here. Ammonia is a toxic inhalation hazard and therefore the ERG will have the appropriate isolation and protective action distances listed. National Fire Protection Association (NFPA) hazard rating guide label for ammonia is HEALTH (3) “extreme danger”, FIRE HAZARD (1) “flash point above 200°F”, and REACTIVITY (alk) “alkali”. 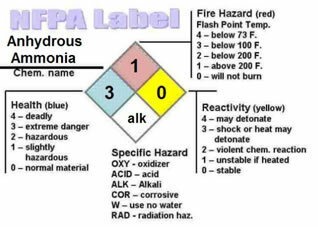 Some NFPA labels may omit “alk” and/or change the HEALTH rating to (2) “hazardous” when referring to ammonia gas. Do not confuse propane tanks with ammonia tanks because although the tanks are similar the response is quite different. An incident from a liquid line or valve (normally orange or red colored) is much more severe than one from a vapor line or valve (generally a lighter color). Remember that liquid ammonia will expand to a gas at 850 times its liquid volume. A nurse tank tipping over onto soft earth has less potential to rupture than one tipping onto asphalt or concrete although both are potentially very dangerous. Oftentimes, if a nurse tank is filled in the morning or evening the tank may heat up enough during the day to cause the pressure relief valves to open up. This is the normal functioning process of a pressure relief valve. The valves should close once the internal tank pressure drops below 250 psi. In this case monitor the tank until the valve reseats. Was the nurse tank being brought to the farm (probably full) or taken back to the facility (probably empty)? All ammonia tanks are never truly empty. Dangerous concentrations of ammonia vapors will normally exist within the tank even when all liquid is removed. The potential release of ammonia in the winter may be small when temperatures are low but much higher during the hot days of August when tank pressures rise. What is the size of the vessel, i.e. a thousand gallon nurse tank, truck, railcar, or a bulk tank? Is the railcar unloading into the bulk tank and the release occurring from the hose connecting both and is the hose the vapor return line or the liquid line? HELP IS A PHONE CALL AWAY: If the incident exceeds the capabilities and resources of the local fire department(s), telephone the Minnesota State Duty Officer for state hazmat assistance. REPORTING REQUIREMENTS FOR THE AMMONIA FACILITY MANAGER: Any uncontrolled release or threat of a release of ammonia must be reported to the Minnesota State Duty Officer at 651-649-5451 or 800-422-0798. Releases greater than 100 pounds must always be reported to the National Response Center at 800-424-8802. Step II. Where is it Going? Since ammonia liquid boils at any temperature greater than 28 degrees below zero the question really becomes in which direction with the vapor disperse to? Ammonia vapor is lighter than air and therefore should rise and dissipate over time and distance. This is not always the case. Dangerous air concentrations of ammonia may hug the ground depending upon relative humidity, temperature, and wind speed. Cooler temperatures with high relative humidity will encourage the vapor to hover near the ground. Be aware of downwind depressions that may collect and hold toxic ammonia vapor. The white cloud that develops with most significant ammonia releases is a poor indicator of the extent of the plume. Dangerous air concentrations of ammonia can extend far beyond the visible white cloud. Always be in contact with the nearest weather station for any unexpected wind speed and directional changes. Airports and the Minnesota Duty Officer can supply this data. Check maps to quickly determine what lies directly downwind of an expanding air plume of anhydrous ammonia, i.e. people, livestock, pets. If there is liquid ammonia present it will puddle or flow down slope. What is down slope? Is there a tile inlet that eventually drains to a ditch, stream or lake? Will liquid ammonia flow across the street and into a storm water sewer grate? Minute amounts of ammonia are extremely toxic to aquatic life and runoff to surface water must be avoided. Step III. How do I Control It? Include all resources in your decisions. An integrated/joint command decision is always preferred. What are my priorities and objectives? What are my goals? Don't forget to seek out and tap the knowledge of the facility owners/operators and transport drivers in your decision making. They work with ammonia every day and they know the plumbing. If they are not present check for contact information on the tanks, posted signs, or incident response plan. If responding to a traffic accident important information can be obtained by reading the shipping documents from the driver or taken from the truck cab. Is an aggressive attack needed to shut down the release source or…do I even need to control it? Will the tank empty shortly and the best action is to do nothing but monitor? An ongoing uncontrolled release will cause the tank to auto-refrigerate which may occur quickly or could last a long time. Should an evacuation of downwind businesses and residences be started or should sheltering in place be communicated? Do you have any sedentary (immobile) populations downwind that would resist evacuations? If ammonia will be released or there is a threat of a release over a long period of time consider an evacuation. Shelter in place those who may be at risk from low air ammonia concentrations. Personally tell them to 1) stay inside their home, 2) turn off any ventilation systems i.e., heat, AC, 3) limit time on the telephone so that they can be reached, and 4) phone number to call for updates. A pamphlet with instructions and contact phone numbers can be quickly composed, printed and then handed out at this time. In summary, gather all knowledgeable people together, review input provided and jointly agree upon a strategic plan of attack. Applying water is the most effective tool to fight an anhydrous ammonia release. Before the decision is made to aggressively attach the release many factors must be reasoned through. Vehicles must approach carefully from up wind or from the side. It is difficult if not impossible to drive across a freshly plowed or muddy field with fire truck apparatus not to mention hauling water out to the site of an ammonia release. Having enough water is vital. As a rule of thumb, 100 gallons of water is needed for every gallon of product released. A 500-gallon apparatus will only allow a few minutes of support. A long-term sustained attack will require lots of water and in rural locations this means shuttle operations. If a fire is impinging on the ammonia tank the pressure relief valves must be working properly. Keep the tank cool by applying water on its shell. Never apply water to a large pool of liquid ammonia. Pools of ammonia will autorefrigerate to 28 degrees below 0. Applying relatively warm water will increase the vaporization of ammonia by raising its temperature. Before applying water, work with the managers to determine where runoff will flow or pond. A simple earthen dike will contain the ammonia contaminated water for later recovery and disposal. Fog streams provide a protective curtain for a safe approach to the source. Attack using 2, 1½ inch lines. Consider additional lines if available. Attack crew should consist of 5 members. A crew leader flanked by a nozzle person and hose handler on each of the leader's sides. All on supplied air. The crew leader should be wearing ammonia rated gloves. All must be on supplied air (SCBAs) and enough air must be available. Rotate nozzles applying maximum flow with the widest fog pattern. Angle your approach to avoid high downwind concentrations. A rapid high and wide rotation is more effective for ammonia absorption. Nozzle end holders should rotate in unison like the wheels on a bike. If a line fails or crew member develops skin irritation evacuate immediately and reassess. Narrow sweep when closing in on source. Narrow fog sweep significantly as you close in on source. Crew leader reaches to valve and tightens it stopping flow. Decontaminate crew members with water prior to leaving scene. These three photographs were taken near Cottonwood, Minnesota during anhydrous ammonia first responders training courtesy of the Cottonwood Fire Department, the Cottonwood Coop, and the Regulatory Management and Consulting, Inc. firm out of Sioux City, Iowa. After the response, invite all players to a critique. Do not wait too long to discuss the incident because ideas for improvement can be quickly forgotten. Update your procedures and make recommendations to the facility manager. The Minnesota Department of Agriculture will investigate the source of release and require the manager to undertake efforts to prevent similar occurrences.